The luxury fashion house, Hugo Boss, was preparing for the launch of the BOSS Green Summer 2012 collection. The menswear line caters to golf enthusiasts who have an appreciation for innovative and functional golf apparel. The brand needed a unique direct mailer to cut through the clutter and grab the attention of its key demographic. To help create buzz, Hugo Boss enlisted pro golfers Martin Kaymer and Nick Watney to film exclusive training videos where the golfers shared tips and gave strategy while decked out in the brand's latest sportswear. 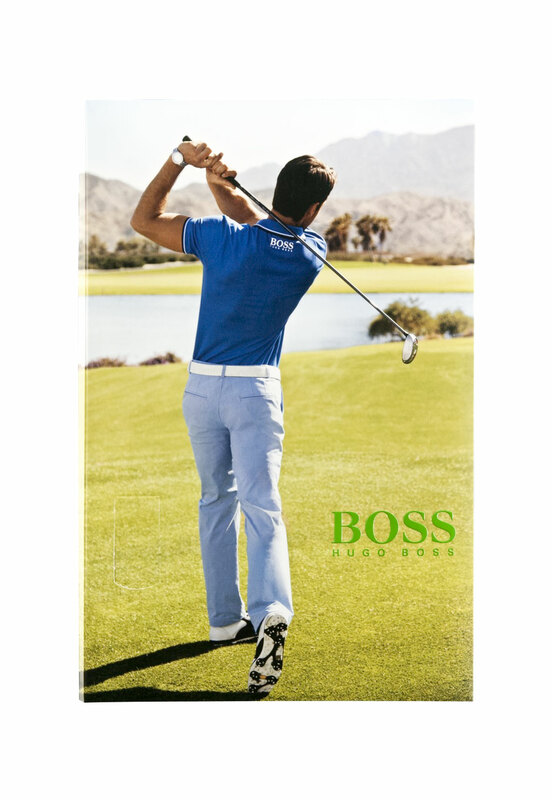 Hugo Boss came to Americhip to create a stylish Video in Print press kit and direct mailer featuring our patented 2.4" VIP screen. The final touch was a ten- page booklet showcasing the clothing against the backdrop of a lush golf course. The targeted audience was thrilled to receive the golf tips and was thoroughly impressed with the one-of-a- kind video keepsake put together by Hugo Boss. Let Americhip help you look this good.